Central park is a jewel within New York City, and although not a primary destination for climbers, scattered throughout its 843 acres are a series of small outcrops, that present the boulderer with an opportunity for some outdoor exercise. Central Park is bordered on the north by West 110th Street, on the west by Central Park West, on the south by West 59th Street, and on the east by Fifth Avenue. There are lots of buses and subway lines that you can use. Check out the details for the individual areas for specifics. There is a comprehensive guidebook available from Sharp End Books titled NYC Bouldering which covers everything in Manhattan. Hey, just popping in to say that I have been slowly updating finishing the online version of this guide -- started back in 1988. I'm also updating and including new photos. Still not entirely finished, but what is there is there. My intention is to complete the guide with the areas it originally covered (Central Park, Ft Tryon, Inwood, Riverside Park) ... and leave the rest to Gaz Leah's great new guide that does a excellent job documenting all the newer areas that've been developed. 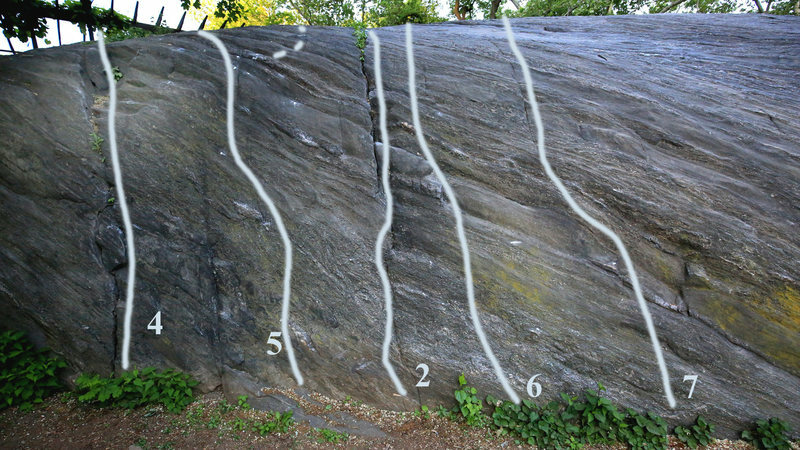 If you're tired of the super tweaky stuff on the mica schist that rips your skin off ... try some of the updated easy problems on Chess Rock. Updated Chess Rock sections. Wonderful moderate vertical problems that few people climb.